This is my first post on the forum so please be patient with me. 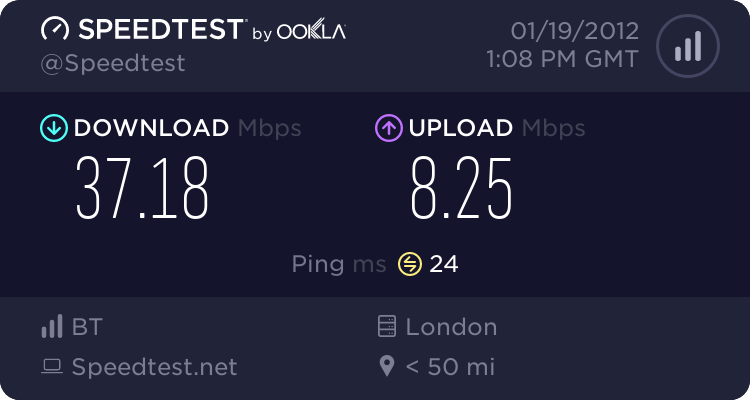 I've just had BT Infinity installed aroung 1 week but I am only receiving around 18-20Mb download when the BT checker stated that I could get 40Mb. I know distance from the cabinet will make a difference but I am not for away from it. What sort of things can I check or test before I contact BT. When the engineer connected the equipment I don't recall him using any equipment to check the sync speed from the master socket. Any help or advice is appreciated. I tried spedtest.net both wireless and wired and was receiving approx the same for both. My laptop has a wireless N adapter. When I tried the BT speedchecker at one point I got a 21Mb result. I just ran the BT diagnostic and got the following result. It states that I have other services running on the line but I am not aware of anything. It looks like I will have to contact BT. Sorry for the quality of the image. Just a tip to help you and us Mike . You can copy and paste the text inside the two results boxes of the BT test, just like any text. We don't need the graphics. Far easier to read that way, and no uploading hassle for you. Also it's in the post, which is better.